To show our commitment to Health and Safety we have appointed a local company Ramsay Safety Solutions Limited to act as our ‘Competent persons’ as required under Regulation 7 of The Management of Health and Safety Regulations 1999. They will ensure that we continue to meet our legal obligations and continually improve our safety performance. 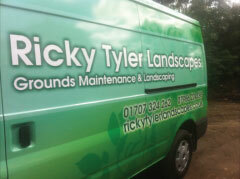 Ricky Tyler Landscapes can provide gardening and grounds maintenance services including Accreditations covering London, Essex, Hertfordshire, Northampton, Buckinginghamshire & Bedfordshire .